In this patent infringement lawsuit, our patent attorneys represented an Oregon patent owner who’s patent was being infringed. 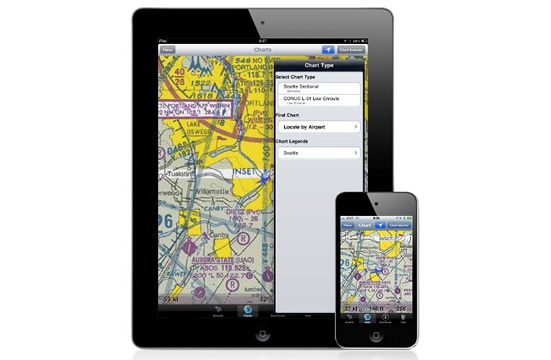 The patented technology involved flight planning software used by pilots on computers or iPad type devices. Our patent attorneys filed a complaint for patent infringement in federal court and resolved the matter by negotiating a settlement agreement between the parties. In this patent infringement lawsuit, we represented an Arizona business accused of infringing a patent by a non-practicing entity, which are sometimes referred to as "patent trolls." Our patent attorneys identified that another party was causing our client damages in the lawsuit and thus filed a third-party complaint to bring that party into the lawsuit. The technology involved in the patent infringement lawsuit was automobile accessories. In this patent infringement lawsuit, the federal court’s personal jurisdiction over the defendant became a key legal issue when a personal jurisdiction motion was filed by the defendant. 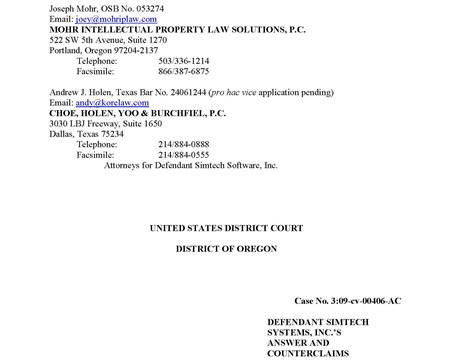 In this case, we represented the patent owner and a litigation objective was to keep the lawsuit in Portland, Oregon, for logistical and strategic reasons. 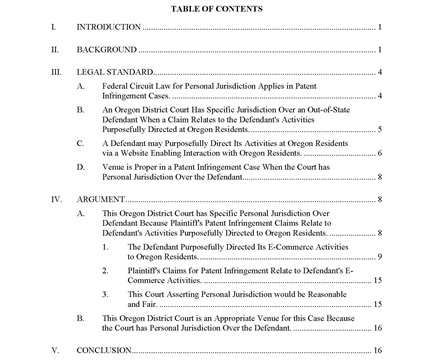 Our patent attorneys prepared a legal brief demonstrating that controlling legal opinions established that the Portland District Court had personal jurisdiction over the defendant. 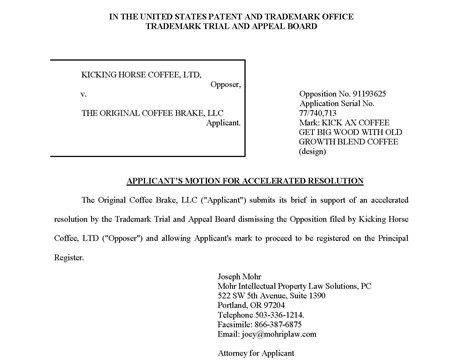 In this Trademark Opposition, we represented an Oregon trademark client who’s trademark had been opposed by a competitor. Our trademark attorneys implemented accelerated case resolution proceedures within the Trademark Trial and Appeal Board to reduce litigation expenses and resolve that matter faster. During the Trademark Opposition, our trademark attorneys managed litigation discovery and prepared trial briefs in support of our client’s interests. This case provides an excellent example of how our trademark attorneys can resolve trademark disputes without the expense and delay of a trademark lawsuit. In this case, our trademark attorneys prepared a cease-and-desist letter on behalf of one of our Oregon trademark clients who’s trademark was being infringed by a competitor. In our cease-and-desist letter, we put the infringing party on notice of its intellectual property liability and demanded that it stop infringing our client’s trademarks. 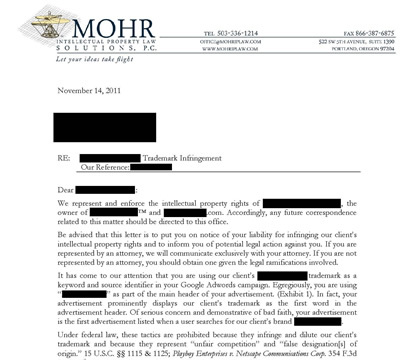 Shortly after receiving our cease-and-desist letter, the competitor stopped infringing our client’s trademarks. In this patent infringement lawsuit, we represented a foreign patent client in conjunction with an out-of-state law firm by serving as local counsel. 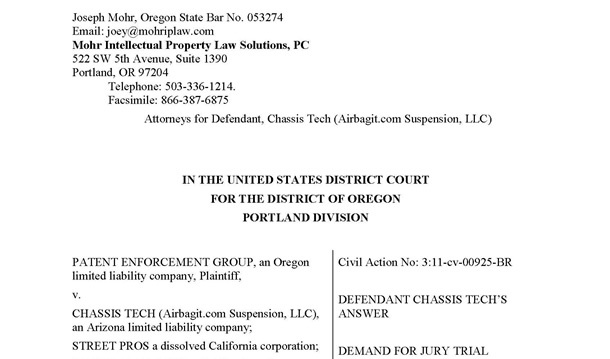 The patent infringement lawsuit was filed in Portland district court, which would have put the client and the out-of-state law firm at a disadvantage. However, our patent attorneys’ specialized knowledge of patent law and local procedures in Portland district court was useful in leveling the playing field for our client.